This week's creations are so stunning, they really rise above! They'll make your heart soar! You'll be flying high with inspiration! Okay, I'll stop and let you see the talented designers' incredible creations. Hello friends! Thanks for keeping me on, I am so excited to be back with you for Week 2: Flights of Fancy! I knew what bird I wanted to use as inspiration pretty early on but how to interpret it into an outfit was a creative conundrum! I went through a few iterations, trying to decide between fabric color, design and pattern usage, but finally after changing my mind at least 3 times I just had to follow through and stick to a design! My inspiration bird for the jacket is specifically a horned owl, this is my favorite bird hands down. They are beautiful, majestic, strong and just gorgeous! I really can’t express the love I have for owls in general! I just love them! The jacket was drafted by me and after playing around with it for hours in Illustrator -- slashing patterns, making mock ups and making sure I could sew it, I finally came up with this subtle yet recognizable design for the coat. I always like to stay a little modern, classic and trendy with any of my creations and this jacket is no exception, definitely my crown jewel so far and I want one for myself ASAP! Aside from the owl as inspiration, I really love over sized draped lapel cardigans and coats, so that was also a point of inspiration for me. For the details on the coat my favorite is the slit pockets. I have been seeing these slit pockets on one of my favorite brand of coats and jackets at Aritzia and I really wanted to recreate it. I guess it would be similar to a welt pocket but it’s more of a slit with no visible flap, just very clean and streamline. (Visit the blog for a more detailed photo). The fabric makes the pocket look almost invisible (which is the point) but on a more solid colored fabric, they look so chic. Head over to Sew Straight Patterns for lots more information! Ladies first! For my first look I really pulled from the Quetzal’s long tail feathers and the triangular shapes the feathers form along their backside when not in flight as inspiration. You can see my inspiration board and bigger pictures on my blog HERE. I used the LLC Alley Cat bodice as my base, drafted in a shoulder opening and designed the back to have 6 layered angles in the feather coloring and formation of the Quetzal. Add in 3 layers in varying length of high low circle skirts in green tulle and the main fabric (a scuba knit from Cali Fabrics) and Voila, you’ve got a Quetzal inspired dress! The trims along the shoulder also form the triangular angles of the feathers and outline the cut outs for effect. To bring in the red chest of the bird and tie the whole look together, I made a bright red beaded necklace on a metal chain. Now for my fearless little aviator! I really, really wanted to do a satin jacket so the sheen would be representative of the Quetzal’s shiny coat of feathers but I couldn’t decide on a style. At first I thought the obvious bomber jacket, but ultimately I decided to draft my own version of a military inspired jacket. I drafted the jacket right on my mannequin with a raised collar that would cinch tight or loose using a cord stop, an elastic casing along the waist, heavy duty snap buttons with velvet trim on the inside, pockets on either chest side dressed up with military patches and sleeve cuffs embellished in three coordinating layers of trim. Because the jacket doesn’t have a lining, the whole garment is sewn with french seams. The top was also drafted on the spot using the LLC basic tee as a base. I changed the back to a racerback style using a green knit for the main, added an asymmetric front layer in a black and white knit and finished off the neckline with a classic collar in the same green knit. The pants are the LLC Canterbury knickers lengthened to pant length with an added faux button flap along the front sides and a folded up cuff using the same embellishment as the jacket. I crocheted an infinity scarf to bring in the red chest of the bird again, and no aviator would be complete without her flight pack. So I made a leather backpack that zips closed and folds over the top to tuck into a contrasting layer of leather, trimmed in a hand stitched gold chain also used in the jacket and finished off with feathers on the shoulder straps to complete her flight pack. Once I got going…I couldn’t stop! I had so much fun creating these looks and I love that my girls will be able to wear them for more than just this challenge. My girls love aviation, we enjoyed visiting the war vet aviation museum in our area and this challenge was very near to my heart so i’ll hope you’ll check out the rest of my pictures on my blog HERE. This week for our Flights of Fancy theme I took inspiration from our fancy winged friends from way down South. Our "penguin suit" takes elements of a traditional tux, like the tuxedo stripe running down the outside of the leg, and mixes in some modern flare with the harem cut of the pant. Using a pair of knit joggers my son had as a guide, I converted them into a woven pattern, adding a front fly and a couple of pleats, in the front and the back, to allow for a contoured waistband to fit his frame. The inner gusset along the full length of the leg echoes the tuxedo stripe with the contrast of black against the printed suiting I ordered from CaliFabrics. I also played with the style lines of the jacket, using the Berkshire Blazer by Blank Slate Patterns as my base. I added my own details of a front and back color-blocked yoke, double welt pockets, and then made fitting adjustments and modifications to the armscye, sleeve and body to fit my broad-shouldered, slender little man. His shirt is based on the Birch Button Up by Sew A Little Seam. The back pleat and included cuffs were eliminated in place of a new angled yoke and elegant French cuffs. The classic look of a traditional white button front paired with a suit jacket gets a little punch of color and fun when the jacket is removed, displaying the contrasting back and sleeves. 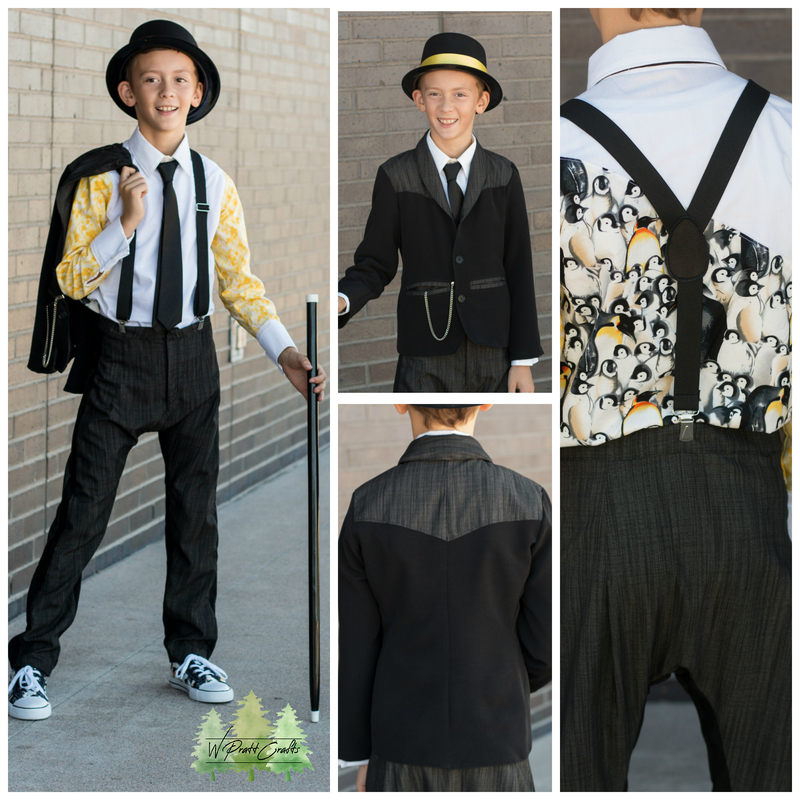 Finally, his look is rounded out with a pair of suspenders made from elastic, for comfort, and a scrap of black leather. 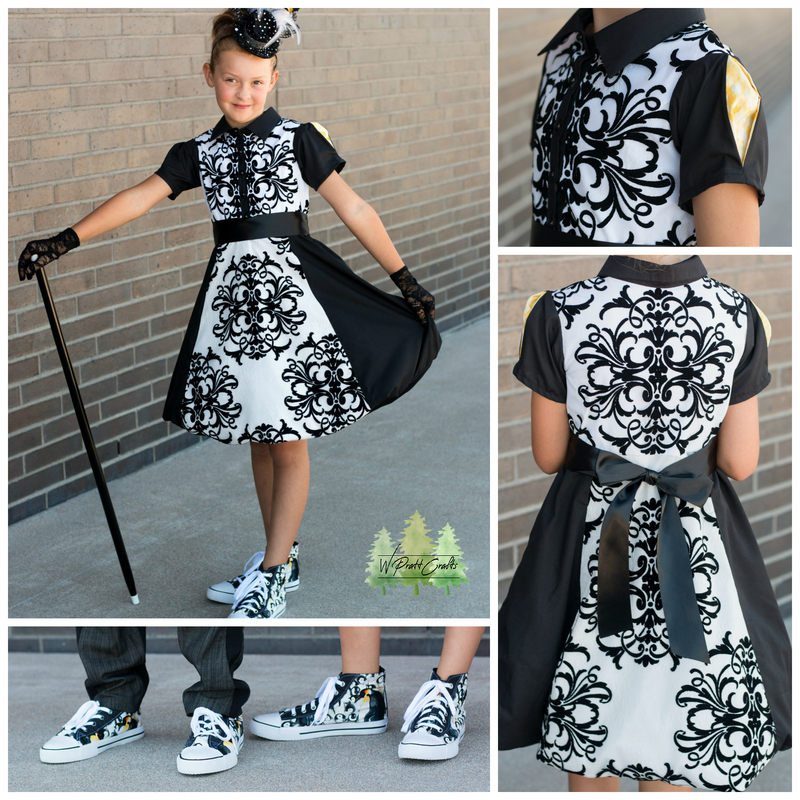 For my daughter's look I continued the penguin inspiration with the black, white, and yellow color palette. I kept the white to the center to mimic the natural coloring of our frozen friends. I found this gorgeous white lace with a beautiful scrolled black flocking over at CaliFabrics. I knew it would be great to help elevate her look and help us achieve the fanciness of this week's theme, though our birds may be *slightly* lacking in flight. I drafted her dress to include a front button placket, collared neckline, and added a touch of yellow by creating a pleated short sleeve. A black satin sash leads down into her A line skirt. An online circle skirt calculator from By Hand London made it easy to figure out the exact measurements I needed to create her 6 paneled skirt, which also includes hidden inseam pockets! Finally, to finish off both of their looks I decided to make their feet happy and modify some formerly hot pink Airwalks from Payless Shoe Source into these penguin lover's dreams. After disassembling the store-bought shoes, I used the pieces as patterns for cutting, sewing, and then reassembling the now penguin studded creations into the original soles. Forty eight grommets later, we had the perfect footwear to polish off their looks and give them completely penguin inspired outfits from head to literal toes. To read more about our flightless and fancy free look, plus the trials and tribulations of making your own shoes, head on over to my blog here. Thanks for reading along and I hope you enjoyed it as much as we do! After reading the theme for week two, I called Thomas over to get his input. He is the one who has to wear this stuff, so I feel like he has some sway in the direction my designs go. Me: "Hey, buddy, week two is 'Flights of Fancy'." Thomas: "What does that mean?" Me: "We are supposed to get our inspiration from birds. What is your favorite bird?" Thomas: Without any hesitation "A snowy owl!" A freaking snowy owl?! Now the challenge is on. What to a do for a snow owl for an eight year old boy?! A snowy owl is a cute little thing. White and fluffy with golden eyes. I could think of a dozen different things to do to represent a snow owl for a girl, or a little boy. But an eight year old boy, what do I do?! Well, do you know what else a snowy owl is? A hunter. A strong bird of prey that lives in a cold, harsh environment. A snowy owl is a symbol of strength and survival. 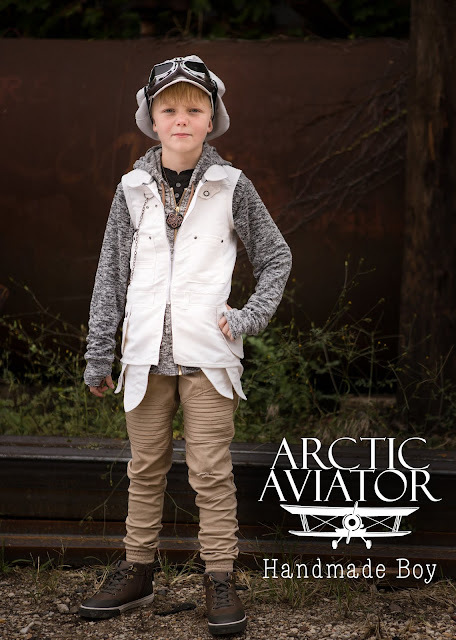 So, inspired by strength and amazing abilities to soar in the open sky, along with my family's love for Steampunk, I created what I call The Arctic Aviator. Arctic Aviator started with the vision of a white suede vest. Layers are a huge part of the Steampunk look, so I knew my look would include several layers, and the self drafted vest would be the feature piece. The drastically curved hem is a nod to the Snowy Owl's tail feathers, while individual feather layers on the sides are a hint towards the great, strong wings. Metal rivets, lots of pockets, metal zipper and chain, and detailed topstitching all give credit to the Steampunk feel my house loves. My next big piece was the distressed moto pants. 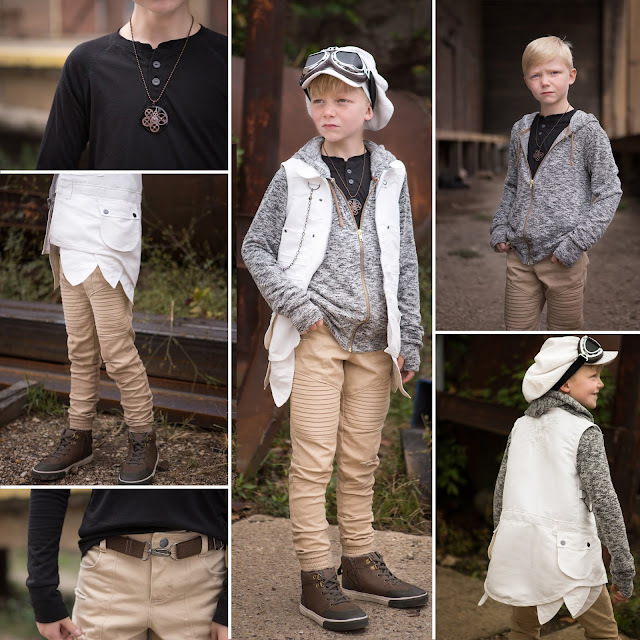 White pants are a terrible idea for my son, so we went with khaki inspired from the legs of the Snowy Owl. Self drafted and sewn from stretch cotton twill, the pants were composed of nine pieces per leg with one panel having a pleating detail. Handmade belt, zipper fly and metal snap, along with distressing, tie the modern look of moto pants to the Steampunk vibe. The slouchy leg stays in place with elastic cuffs while giving Thomas freedom of movement to hunt for rocks and climb. The brushed sweater knit I used for the zipper hoodie gives notes of the dark flecks mixed into the Snowy Owls bright white feathers. Details for the hoodie were kept to a minimum so as to not overpower the outfit and distract from the main features, the vest and pants. Thumbhole cuffs were a must though. ;) I used Love Notions Sloane for the start of this piece, added the zipper front and lengthened the sleeves to give a slouchy feel to match the pants. Layered under the hoodie is a black slub cotton raglan henley. I used Titchy Threads Safari Raglan for the start, added the henley neckline and changed the cuffs to a taller style. Now, I know white would be the obvious choice for this piece, but it lacked the contrast I felt this look needed. And in the end, the triangle portion of the shirt peeking out from under the other pieces reminded me of the strong, black beak on the Snowy Owl. To keep true to a classic layering piece, details were kept minimal with reverse coverstitching on the sleeve seams and dark gray buttons. 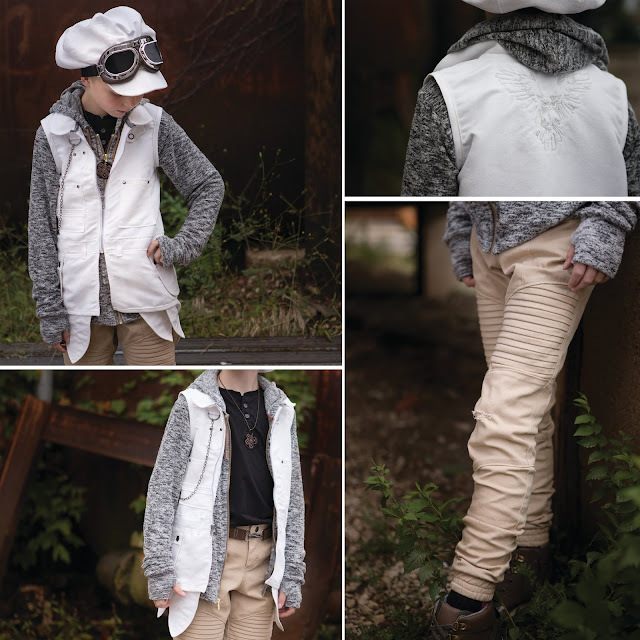 Final touches to our Arctic Aviator include a slouchy newsboy style cap and aviator googles. The hat started with Peek-a-Boo's Newsie Hat. I left off the brim, drafted a new one and changed the construction so it would have a layered look. This also allowed the brim to sit more like a ball cap giving a vintage look a modern update to tie in with the modern style pants. Join me at Handmade Boy for more photos and details. It is the second week of Project Run and Play and I am beyond thrilled about this week's theme: Flights of Fancy. I love birds so much but I really had no idea what I was going to do until I was scrolling Instagram and saw my friend and her family at one of the most beautiful water fountains I'd ever seen. I knew I had to shoot there and I had a very editorial photoshoot in mind. I ended up settling on a swan because they like to swim in fountains, I think, and what bird is more elegant than a swan?!? I really wanted to make a gown that will stand out in front of this grandiose fountain and a white swan just wouldn't do it in my opinion, which led me to the idea of doing the Black Swan. 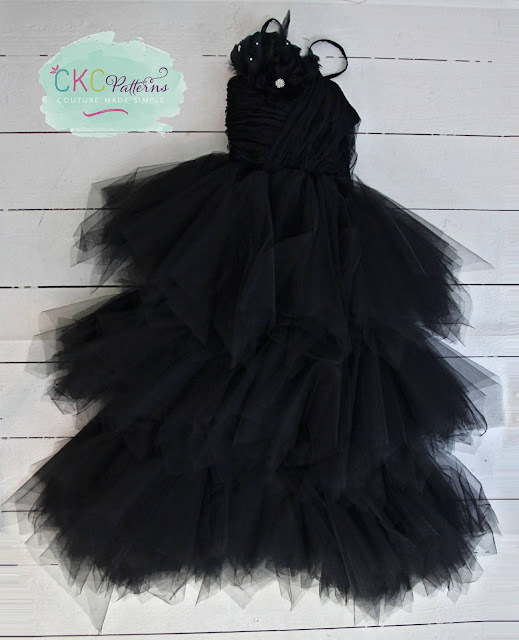 I was inspired by Natalie Portman's version of the Black Swan with the crown and the makeup, but as you'll see my gown is no tutu! When deciding on a gown, I wanted to make sure I was making something that was reminiscent of a swan without having to spend a fortune on feathers...because I looked and believe me, I could have easily spent hundreds of dollars designing this dress!!! 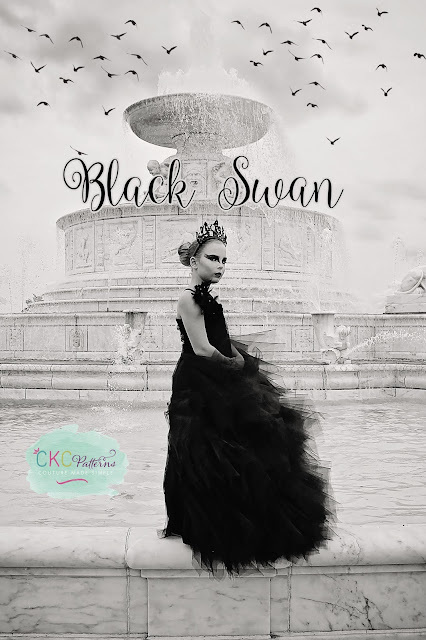 After much consideration, I settled on our CKC Berlin's pattern for the dresses inspiration because I thought the skirt kind of resembled feathers and perhaps, with multiple tiers, it could really look like a swan!?! For the bodice I used a combination of CKC Betty's and CKC Charlotte's. I had to cut 148 squares of tulle for this dress which equalled a little over 50 yards when I was done! I've never created anything like this before and working with this amount of fabric was interesting to say the least. It took me as long to sew this one dress as it did to sew all 14 pieces in last weeks theme! It was so worth all of the effort though. My daughter had so much fun dressing up and playing an evil character; thats why she's not smiling in any pictures, she took it very seriously! For the base of the bodice and the skirt I used rayon challis because it has such beautiful drape and is fairly easy to sew with. I drafted a quarter circle skirt and cut it into 3 tiers to sew all of the tulle onto. I used crushed tulle and free-hand draped it on the bodice. I added feathers, a handmade rayon challis flower, and a handful of rhinestones to accent the bodice. I'm just so pleased with how this entire week turned out from the dress to the photoshoot. To see more photos from the shoot and read more about how I made this dress, check out my blog here. Now it's your turn, support these designers with your VOTE! Whew! These talented ladies sure made it hard for this week's celebrity guest judge, Abby Glassenburg from While She Naps! I’m completely blown AWAY!! You ladies crushed this week. This one was TOO HARD to choose! Seriously, too hard to choose! They are all so amazing! All the designs are amazing! Hard to choose.